How runners are understood by the general public versus how we understand ourselves can be two different things. There are a few questions or conversation topics that are always brought up once someone finds out you’re a runner. Here they are, and here’s why they can be frustrating. Jogging is understood by some people as a synonym for running, but this couldn’t be more upsetting to most runners. We do not jog. We run. Fun fact: jogging with a soft j, pronounced phonetically as yogging, is OK. I can’t explain its etymology but it’s less offensive. My best guess is that European stuff is always cool. Runners are often asked if they won when they return home from a race. The exact same question is also usually asked before a runner goes to a race in the form of, “Are you going to win?” Answer: probably not. And furthermore, I’m not ashamed. Because if I was going to win the Boston Marathon I would not be working in this office. First off, it’s usually called a personal best. Secondly, there are events other than the marathon. Thirdly, lots of people run their entire lives without ever running a marathon. And while we’re here, yelling ‘keep going’ isn’t that helpful. How long is your marathon? Typically a standard issue 42.2K. You tell someone you’re a runner and they respond with, “I could never.” Yes you could. Yes you one hundred per cent could. You just don’t want to, and that’s totally OK. Keeping in mind that there are some people with medical or social conditions that prevent them from running, most people are able to run if they choose to. This question is in the same camp as, “Aren’t you cold?” Answer: sometimes, yes. But for the most part I have weather-appropriate clothes that make running in the elements bearable. And when it isn’t? Hello, treadmill. Oh, I ran in school. Almost everyone was forced to run in elementary school. This isn’t much of a talking point. What sneakers do you wear? Just because shoes work for me, doesn’t necessarily mean they work for you. There are so many types of feet, so get yourself assessed properly. Also, they’re running shoes or shoes or runners, not sneakers. 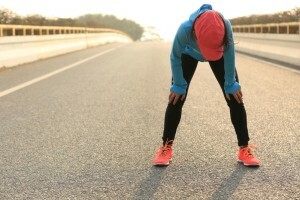 There’s an assumption that if you’re a runner, you must run everyday. For almost every runner, the answer is no. Even professionals take days off. In order to keep the love alive, you have to take some breaks.